It feels like a day doesn’t go by that I don’t receive an email letting me know of something cool for mobile devices. With the ever increasing onslaught of tablet and smartphone use in pharmacy practice it’s only a matter of time before everything will be available in some electronic media format. There’s a link in the ASHP web store leading to a “getting started video”, but I couldn’t get the video to run. Little bit of a fail. 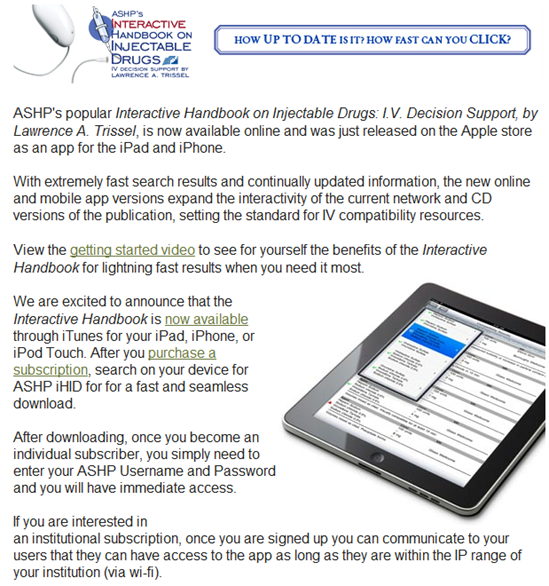 Perhaps ASHP’s never heard of YouTube. Who knows.